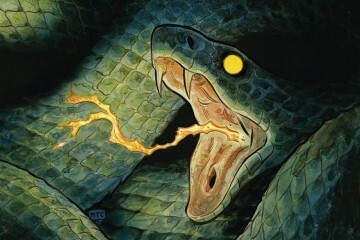 I’m always hesitant when I hear that a favorite comic is going to be turned into a television show or movie. But in this day and age where every studio has their eyes out for the next big comic property it’s only a matter of time before every great comic book gets picked up. Hence Deadly Class, SYFY’s adaptation of Rick Remender and Wes Craig’s incredible Image series of the same name. I first heard about the adaptation in the back of the comic last year, and although my fear was there, it was only for a moment as it was stated that the Russo Brothers were going to be the executive producers and Rick Remender himself was going to be involved. I became excited when I saw the first promos and my anticipation only grew as the premiere date neared and my expectations for the first episode were exceeded as Deadly Class the show completely blew me away. Deadly Class is a simple concept, a school to train the next generation of assassins. The school is comprised of legacies, students who come from families with a killing pedigree, and rats, students off the streets with the potential gift for killing. Yet stacked upon this simple concept are layers and layers of depth with wonderful characterization, social commentary, love, loss, and a whole lot of teen angst. Since its inception the comic has been consistently excellent and thankfully the TV show looks to follow in the same vein. The first episode feels like it was lifted directly from the pages of the first story arc, Reagan Youth. Marcus Arguello is a homeless street urchin who lost his parents years before and is a wanted criminal for burning down the boys home he was being abused in with the boys still asleep within. Master Lin, the headmaster of Kings Dominion, sees potential in Marcus and sends some of his students to collect Marcus and offer him admission. Eventually Marcus agrees but his reputation as a mass murderer precedes him and puts a mark on him before he attends his first class. Deadly Class is full of everything a reader of the comic would expect. Marcus and his friends appear as if they were lifted right from the page of the comic. The student population is made up of all the same cliques (the Preps, the Yakuza, the Dixie-Mafia, the Eastern Block, the Cartels, and of course the Rats) and Marcus’ can’t seem to help himself from getting into conflict before he attends his first class. Billy, the punk with a heart of gold, quickly adopts Marcus as his friend and teaches him the do’s and don’ts at Kings Dominion, and Marcus quickly ignores all of the lessons. The classes are incredible with my favorite being Master Lin’s AP Black Arts, since of course there would be Advanced Placment at Kings Dominion. There’s enough teen angst to be attractive to a younger audience but enough ‘80s nostalgia to appeal to the Generation X’ers the source material is aimed at and the viewer really has to wonder, can Marcus survive his first year? Deadly Class has a brilliant cast. Benadict Wong plays a devious Master Lin while Benjamin Wadsworth really embraces who Marcus is, giving the character a sense of loss, fear, hope, apathy and anger all at the same time. I loved seeing Henry Rollins as the professor of poisons, a truly fitting casting for a series set in 1987. The remainder of the cast plays their roles perfectly, embracing their comic counterparts, giving life to the fan favorite teens and I cannot wait to see how the first season plays out. 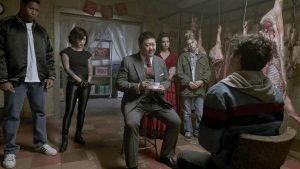 Verdict: SYFY’s Deadly Class is an excellent adaptation of the source material with their own style and take. It’s full of great characterization, mystery, intrigue, and good old teen angst. Any fan of the comic should rest assure that this is a wonderful adaptation with a love and respect for the comic book and it is a definite Watch!